As many of you know, last Spring we brought the carbon fiber fabrication of our harps in house. For those of us here at Heartland, it’s hard to believe at this time last year we were in the midst of retrofitting our new building in preparation to begin producing harps. As they say, ‘necessity is the mother of invention’, and that certainly has held true in Heartland’s situation. We are (of course) not the first carbon fiber shop in the world, but we are the first carbon fiber shop dedicated to building the world’s only all-carbon-fiber musical harps. Our founder and owner, Dave Woodworth, built wood harps for 25 years before creating the world’s first all-carbon-fiber harp in 2009. For many years, the carbon fiber parts were fabricated by a shop that specialized in Formula One race cars located near Charlotte, North Carolina. This relationship worked quite well until the summer of 2017, when the owner of the carbon fiber shop retired, and sold the business to someone else. Dave and Christian Burr (now our head of operations) began to explore the idea of opening our own carbon fiber shop. 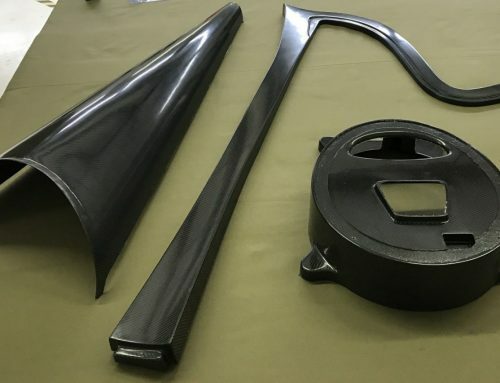 They knew this would be a huge undertaking, but were also keenly aware of the enormous difference our carbon fiber harps were making in the world. Over the years, Heartland has received countless emails and letters thanking us for creating harps that allow them to play more comfortably (in all kinds of weather), transport their harps with more ease, and delight with a beautiful rich and resonate tone. Heartland Harps simply had to live on. Over the course of several months, they were able to find a building and locate some excellent equipment, including a 13-ton, 9-foot diameter autoclave, and a 24-foot-long computer-aided cutting table. In addition to equipment, they also expanded the team by hiring Scott and Brittany, experienced and skilled at carbon fiber fabrication, and myself (Carrie), to head up sales and marketing. We kept hearing–from people who certainly knew–that it takes 18 to 24 months to set up a carbon fiber shop. Amazingly, we were in production after only four months. Last May, we began producing the first carbon fiber harps in our facility. It has been a busy year… from establishing relationships with all the various vendors and suppliers, to finding and hiring more staff to meet our growing demand, to getting the systems in place and running smoothly. At times during this process, our estimated timelines for harp production were unfortunately, yet unavoidably, delayed. Today we number a team of nine (soon to be 10), including a full production team. We are continuing to grow and develop (as a team and as harp builders). And, we are happy to say that we have hit a stride in our production process, helping us to more accurately predict our estimated harp completion times. We have recently acquired two new pieces of equipment that will aid in streamlining the build process of both our Starlight pedal harp and lever our harps as well. The new Panther CNC 3-Axis mill will allow us to cut and drill the Starlight faceplates–a process which up until now has been outsourced. This machine will also precisely mill all the various harp components of all of our harps. And our newly-acquired 3D Printer platform will be used to print the pedal box bridge, spring sleeves, and other ancillary pedal action parts. In addition, it will expand our ability to prototype, and have increased control over innovation of the harps, both now and into the future. We are in the process of introducing new models and refining existing models, and finally able to take advantage of doing all the work ourselves. And we will be introducing a number of new harp models–both lever and pedal–over the next two to three years. We will now be able to work with more harp stores and dealers in the US and around the world, so our harps will be easier to see and try out. We have a number of tours and harp festivals planned throughout the coming year. You may have noticed another change–our brand new Heartland Harps logo. There are so many more new and exciting changes planned for Heartland this year, so be sure to stay tuned! We want to extend a huge thank you to all our harp owners and supporters for your patience and understanding during this challenging, yet exciting transition! We couldn’t have done it without you!